Abex Document Converter Pro — мощный инструмент для конвертирования офисных документов и изображений с функцией распознавания текстов. Поддерживает преобразование MS Office документов, таких как Word (DOC, DOCX, DOCM), Excel (XLS, XLSX, XLSM), PowerPoint (PPT, PPTX, PPTM, PPS, PPSX, PPSM), RTF, HTML, PDF, TXT и других. Также поддерживает преобразование изображений JPEG, JPG, TIFF, TIF, BMP, PNG, GIF, EMF, WMF, JP2, J2K, PCX и других форматов. Программа не нуждается в Adobe Acrobat или других программах для преобразования файлов, в том числе защищенных паролем. Пакетный режим, настройка параметров конвертирования. Высокая скорость и высокое качество результата. Приятный дизайн, интуитивно понятный интерфейс. Abex Document Converter Pro is an All-in-One document conversion tool that convert any PDF document, Word, Excel, PowerPoint, HTML, Text, Image to other formats with high good quality. Abex Document Converter giving you a fast and easy way to convert documents between PDF, DOC, DOCX, DOCM, XLS, XLSX, XLSM, PPT, PPTX, PPTM, PPS, PPSX, PPSM, HTML, HTM, Text and other image types like JPG, JPEG, BMP, PNG, PSD, TIFF, GIF, EMF, WMF, JP2, J2K, PCX etc. And it is designed to recognize the text in your Image files to editable Word, RTF, HTML, Text document. • It support to convert between many different Document and Image formats. • Batch conversion supports processing dozens of document files one time. • You can add the entire folder and sub-folder to convert. 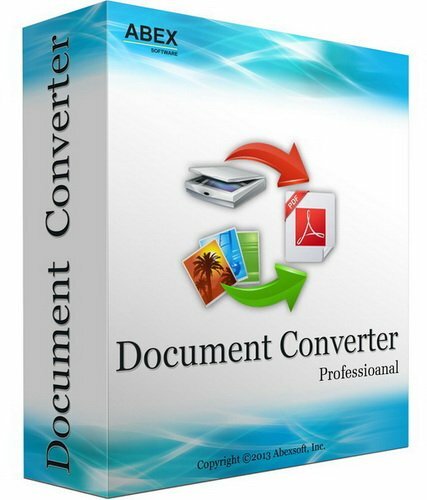 • You can drag and drop documents to be converted into Abex Document Converter Pro. • Standalone software, Adobe Acrobat and Reader NOT required. • Supports MS Office 97-2003 (*.DOC, *.XLS, *.PPT) and MS Office 2007 2010 2013 (*.DOCX, *.DOCM, *.XLSX, *.XLSM, *.PPTX, *.PPTM, *.PPSX, *.PPSM) format document. • Convert Image format to editable Word, RTF, HTML and Text. • Able to convert password protected PDF files. • Option to specify page range of PDF to convert. • Retain the original layouts of your PDF, Word, Excel, PowerPoint, HTML document. • Create high-quality image formats from PDF, Word, Excel, PowerPoint, HTML, Text. • Generate multi-page or single-page TIFF files from PDF, PowerPoint, Word. • Custom DPI when convert PDF to SWF, Image format. • Convert each page of PDF, Word, RTF file into a single image. • Support color depth and resolution settings for the created Image files. • Custom JPG JPEG image quality from 1-100. • Custom output image size. • Convert all pages of PDF into one single Excel sheet. • Option to specify Word/RTF page margin and page size. • Supports to convert each slides of PowerPoint to single PDF. • Merge several image files into a single multi-page PDF file during batch converting, or convert each image file into individual PDF file. • Convert each page of Word, RTF file into a single PDF document. • Custom to set the output PDF password for protection by user/owner password. • Set file permissions to restrict printing, copying, and future modifications for the created PDF document. • Create multi-page PDF from PowerPoint, Word, RTF, TIFF, GIF. • Create multi-page PowerPoint from multi-page PDF, Word, TIFF document. • Create multi-page PowerPoint from Excel workbook. • Convert Text to multi-page PowerPoint. • Merge several image files into a single PowerPoint file during batch converting, or convert each image file into individual PowerPoint file. • Adjust image width and height to adjust the PowerPoint slide size automatically. • Custom to set PowerPoint slide size and paper orientation. • Convert all images to multi-frame SWF video. • Convert all pages of a multi-page Word, RTF, PowerPoint to a singe multi-frame SWF video. • Custom width, height and frame rate for created SWF video. • Adjust image width and height to adjust the SWF frame size automatically. • Supports to rename output file if file exist or overwrite the file. • Convert each file to separate directory within output folder. • Only a few clicks to complete the conversion with supervising the whole process on real time.